In an era of stagnant wages, intergenerational divides and increasingly concentrated wealth and opportunities, the current policy consensus is neither fair nor is it working for a growing segment of the world's population. A recent Pew Global Poll found 52 per cent are not satisfied with the way their democracy is working. For many, the status quo means a future that is not better, with a majority believing that quality of life for young people will be lower than that of their parents. Australia is no exception. That same poll found that 41 per cent of Australians are not satisfied with how democracy is working here and that less than half of the country has a lot of trust or somewhat trusts that the national government will do what is right for the country. Over two thirds of Australians believe children today will be financially worse off than their parents. The dissatisfaction and concern about falling living standards for future generations is leading to longstanding policy assumptions being rethought, and nothing symbolises this more than tertiary education. Across the world over recent decades there was a shift towards user-pays in tertiary education. That is now being reversed. The platforms that British and New Zealand Labour took to elections this year show this understanding emerging, with both having policies to make education free once more. Even Hillary Clinton took a tuition-free college plan to the last US presidential election. It is time for Australia to follow suit. In Australia, the argument for income contingent loans for higher education was that it financed the expansion of higher education, and that public funding is otherwise mainly subsidisation of those who are better off, who would go to university anyway and become better off still. The mantra was that a tertiary education would lead to substantially better life financially. However, with degree inflation in combination with stagnant wages and rising house prices, students are racking up debt without it necessarily leading to a life that is materially better than that of their parents. Many fear that this will result in the first generation that will be worse off than their parents since the Second World War. "Higher education is no longer the ticket to a much better life because of the precariatisation of formerly middle-class 'white collar' professions." Though under the present regime payment only occurs when a certain salary threshold is met, the psychological impact of that debt cannot be underestimated, particularly in light of soaring house prices. It fundamentally damages the compact that private payment for tertiary education means future opportunities that result in a person being substantially better off materially. It can seem like a future of endless debt without a career path or security. Between 1991 and 2016, the average cost of an undergraduate degree more than doubled. Full-time entry level jobs are increasingly hard to find — even for those with a degree, give that there are an estimated 20 graduates per available job. Some cannot even afford to rent on the wage that entry-level jobs pay in their respective areas. Housing is increasingly out of reach, with housing in Sydney costing ten times the average annual income in 2015, up from four times the average annual income in 1985. No wonder that almost 40 per cent of Australians who do not own a home cannot currently afford to buy and another 20 per cent do not think they will ever be able to afford to buy. Falling real wages, increased income precarity and collapsing home ownership rates all strengthen the case for free education. Higher education is no longer the ticket to a much better life because of the precariatisation of formerly middle-class 'white collar' professions. While free higher education is not the only stance worth revisiting in Australia, it is symbolic of many policy areas that require a massive rethink: how we treat housing, the role of government in providing employment opportunities, the operation of social security and the taxation of wealth. This current era of inequality and insecurity demands a break from the policies of the present. Bold ideas like free higher education for a better future are needed because without hope, there is only distrust and resentment left. Recent articles by Osmond Chiu. I went through university in the days before the Whitlam Government abolished fees. At that time the fees weren't all that high and hardly anyone paid them, most were on scholarships. Government policy now sees a university education as a personal investment in increased income, not, as the Whitlam government did, an investment in the intellectual skill base of the nation. We need to do other things as well as abolishing fees to achieve effective development and use of these intellectual resources, but getting rid of the fees would at least be a good start. There is choice: we go back to 15% o the population going to Uni and the tax payer covers the whole cost, or we allow 45% to have the chance of a degree and the tax payer covers half the cost. In this latter scenario the tax payer cannot afford the lot, and the obvious people to share the burden are those who get the personal advantage from higher eduction. And indeed, the evidence is overwhelming that there are still major relative advantages, economic and broadly cultural, to having exposure to higher education and a uni degree. Life is certainly tougher in some ways and more competitive than it was for graduates 20plus years ago in this globalised world, but overall the opportunities and quality of like are also much improved. And frankly, it js a waste of time looking back. I agree with Osmond Chiu that there is much dissatisfaction with our democracy and for the many reasons he mentions. Currently, we urgently need a change in our national priorities. The main priorities should be effective care of the environments (reducing greenhouse gases and general pollution that is causing public health problems) to ensure the viability of future generations, social justice, human rights, equality and fair dealing between nations. And I agree that education should be freely available to all. Many will argue that we cannot afford this, but if our leaders did not involve us in US instigated wars, refused to give huge payments to the big corporations and forced them to pay a fairer share of tax and made the polluting industries to clean up and fine them, we would find that we had more money available for free education and better social services. Providing free education is a mark of a more accepting, a more equal and a more caring society. I can only assume that you have crafted the words; precarity (noun) and precariatisation (noun from verb) from the real word precarious. They are nice words but trying to work out what they mean is very distracting from the point that you are trying to convey. Best get the words in a dictionary first before we use them in a public forum. What was the article about? 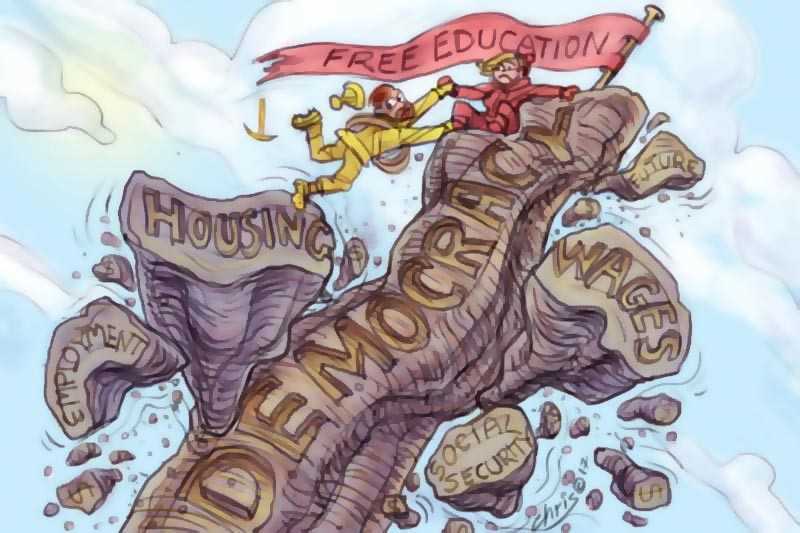 Oh yes, free tertiary education. I agree. Thanks Osmond. Paul, precariat is in the Macquarie dictionary, and there's lots written about it. I agree with the article - it's a stupid society that spends its wealth on huge houses, huge cars, and a lot of other rubbish, when it could invest in educating the population. But Eugene has a point - except I think the answer is to offer more of the courses at a (free) TAFE level, and to take back control of the universities, because as we see, their corporate interests in taking in ever more customers, at ever higher fees, is not in the community's interest. The benefit that comes from education should be captured in a more progressive taxation system - the only fair way to do it. I agree with Osmond and Andy. But it's important that free education also extends to pre-school, primary and secondary government school education. Many people are not aware that government schools cost money for those who attend. Computers, "levies", elective subjects, excursions, uniforms all contribute to rising school costs for families and students. Many, many students are being left behind educationally from a very young age due to financial restraints. All levels of education must be free. There is clearly an idealism behind this article around promoting greater equality of wealth, opportunity and power in our society but free education reminds me of the 70s, free love and all that went with it. To some extent it is preoccupied with university fees when the reality is that differential in costs are occurring as early as pre-school and certainly evident in many sought-after secondary Catholic schools where 'status, rather than the quality of learning, is the driver. Rather than focus just on university funding at the end of the spectrum adopt a systemic approach for all educational costs. The other point you could argue for is less intake into universities: we would be far better served as a society with more apprenticeships and VET courses. You might even argue for the development of more critical perspectives as a graduate attribute in students. So often these days a university degree is conceived purely in earning terms: what about producing generations of students who are not acquiescent in the work force but emerge with radical fabian views of equality of opportunity for all?